Last Act Of Love - ubiq bookshop: the best place to buy books! In the summer of 1990 - two weeks before his GCSE results, which turned out to be the best in his school - Cathy Rentzenbrink's brother Matty was knocked down by a car on the way home from a night out, suffering serious head injuries. He was left in a permanent vegetative state. Over the following years, Cathy and her parents took care of Matty - they built an extension onto the village pub where they lived and worked; they talked to him, fed him, bathed him, loved him. But there came a point at which it seemed the best thing they could do for Matty - and for themselves - was let him go. With unflinching honesty and raw emotional power, Cathy describes the unimaginable pain of losing her brother and the decision that changed her family's lives forever. 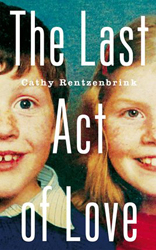 As she delves into the past and reclaims memories that have lain buried for many years, Cathy reconnects with the bright, funny, adoring brother she lost and is finally able to see the end of his life as it really was - a last act of love. Powerful, intimate and intensely moving, this is a personal journey with universal resonance - a story of unconditional love, of grief, survival and the strength of the ties that bind. It's a story that will speak to anyone who has lost someone close to them, to anyone who has fiercely loved a sibling, and to anyone who has ever wondered whether prolonging a loved one's life might be more heartbreaking than saying goodbye. Featured in the Deepest Winter 2015 Great Reads Newsletter.